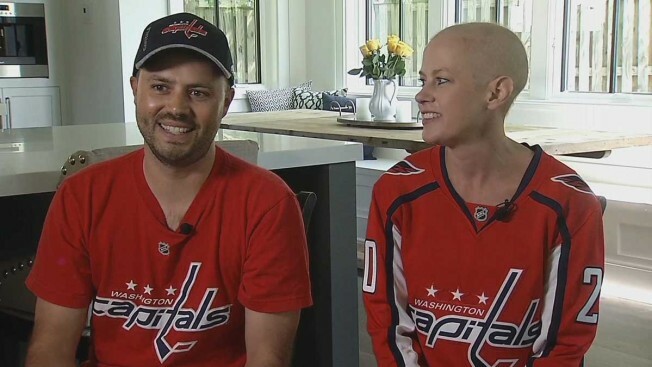 A woman battling cancer at the Mayo Clinic returned to the D.C. area to see the Washington Capitals' playoff run in person Tuesday. Amanda Wilson has been a Capitals fan since childhood, but she was unsure whether she would be able to attend one of the team’s postseason matchups. Her friend, Jenny, said she would purchase Wilson and her husband tickets as soon as Wilson felt better from her chemotherapy treatments. Wilson said she was unsure she’d feel well enough to make the trip. Following Wilson’s cancer diagnosis the Colorado residents moved to Minnesota, where Wilson is undergoing treatment at Mayo Clinic. But doctors cleared her to fly, enabling Wilson and her husband, Scott, to attend Game 3 of the Eastern Conference Finals at Capital One Arena on Tuesday night. Though the couple has followed the team on TV, Game 3 was their first game in the District since Dec. 23, when they watched the Capitals fall to the Las Vegas Golden Knights. Wilson’s college friends had a custom jersey that says “AMANDASTRONG” created and signed by several players. Capitals games have proven to be a positive distraction for Wilson, who underwent what she was told would be a routine pelvic exam after dropping her kids off at work Feb. 21. Wilson had swelling in her right leg and thought medicine would solve the problem. Initially, doctors believed Wilson had a blood clot and said it would require emergency surgery. But a pelvic exam revealed a cancerous tumor in Wilson’s inferior vena cava, a vein that helps pump blood from the legs to the heart. After arriving in Minnesota, Wilson underwent three rounds of chemotherapy. It had little success shrinking the tumor, a necessary step before it could be removed. “I’m not going to spend another day crying about this ... if I can spend another day with my kids laughing,” Wilson said. When Wilson returns to the Mayo Clinic on Monday, she will begin five weeks of radiation. She hopes to have surgery to remove the tumor in August, she said. First, though, she’ll be cheering the team on in person for the first time in five months.